The Sixth Roman Imperial Legion Ferrata established a permanent base at Tel Megiddo in the Jezreel Valley during the early 2nd century AD. This display of Roman muscle, along with the Tenth Legion Fretensis in Jerusalem, was intended to stabilize a region that had already produced the Jewish War (AD 66-73) and would soon give birth to the destructive Bar Kochba Revolt (AD 133-136). As it turned out, the Sixth Legion Ferrata may have done its job. The Bar Kochba Revolt centered itself in Judea with little impact on the Jezreel Valley. 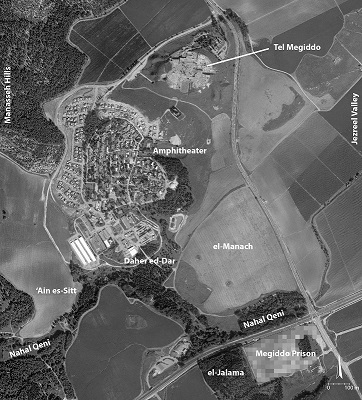 The Roman Sixth Legion stayed by Tel Megiddo for at least a century. Centuries later, an Arab village in the area continued to show its legionary roots with the name Lejjun (or, Lajjun). The village of Lejjun endured until 1948, but the exact site of the original Roman camp was just recently located. 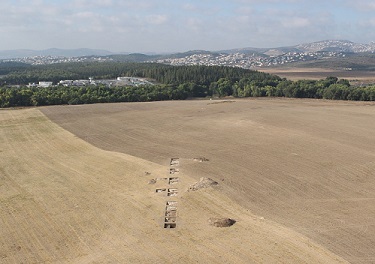 In 2013 an archaeological team uncovered buildings from the camp in a field just south of the tel. The area of the discovery is a field labeled “el-Manach” just below-right of center in the photo below. You can read a well-illustrated summary of the excavation’s finds here. Just below el-Manach is a crossroads that has been strategic for millennia. 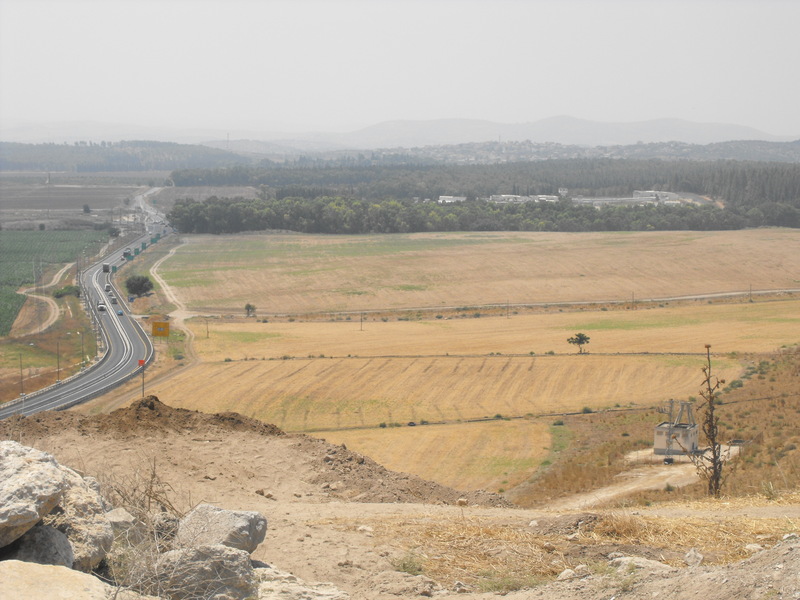 The road coming up from the bottom center is the exit from the Megiddo Pass (also called Wadi Ara or the Aruna Pass), connecting Megiddo to the Coastal Highway. The el-Manach field is perfectly located to guard the crossroads, and it was here that the Sixth Roman Imperial Legion established its permanent base. 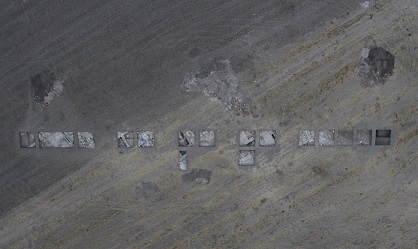 Excavation squares from the 10-day expedition in 2013 are visible below. Below is a photo I took of this same field during a visit to Megiddo in 2012, one year before the excavation. I plan to be at Megiddo in just a few weeks and will try to post another photo of this area. If you want to see this yourself, come with me to Israel this fall. The tour registration closes next month, so now is the time to decide to go. You will not regret it! This entry was posted in Ancient Rome, General Archaeology, Israel, New Discoveries and tagged 6th Legion, Allenby, Ancient Rome, Armageddon, Aruna Pass, el-Manach, Ferrata, Jezreel Valley Regional Project, JVRP, Lajjun, Legio VI, Legion, Lejjun, megiddo, Megiddo Pass, Sixth Legion, Thutmose III, Wadi Ara, Yotam Tepper. Bookmark the permalink. There is an article about Legio X Fretensis and Masada in the current issue of BAR. I wrote about it in my blog post tonight. I am looking forward to hearing about the dig at Lacish. I was reading that article this afternoon. Very informative and, as is usual for BAR, well-illustrated. It will be useful during my group’s visit there in about three weeks. To whet your appetite on Lachish, right now they are surveying with ground penetrating radar to look for evidence of a water system such as at Hazor, Megiddo, et al. It would be news if they do actually find something.